One of the largest charity fundraisers of its kind in Ireland returned to Belfast on Saturday 23rd May, as The Lord's Taverners NI hosted The Waterloo Ball at the King's Hall Pavilion, to help support disabled and disadvantaged young people and children. 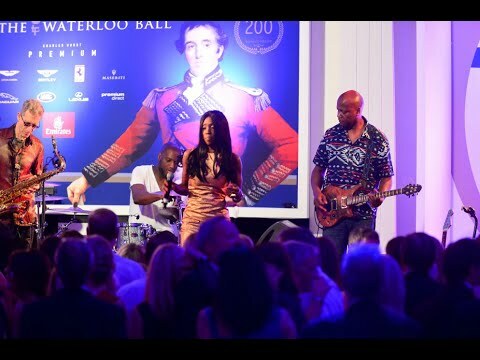 Helping to celebrate the 200th Anniversary of The Battle of Waterloo, the event played host to over 800 guests and garnered support from a plethora of local and national companies including Charles Hurst Group. For the first time, Charles Hurst Premium, with its brand representation including Aston Martin, Bentley, Ferrari, Maserati, Lexus and Jaguar Land Rover, was the headline sponsor of the event and assisted The Lord's Taverners in delivering a Platinum reception, including a prestigious automotive display. "I spoke with Leo Callow, Event Organiser, about a year ago and we were absolutely delighted to become involved. It's a great platform for us to show off our premium and specialist brands. We are also delighted to support what is a fantastic event and a great cause." Invited guests and customers of Charles Hurst Group were treated to an all-star entertainment line-up which included the now world-famous Overtones, local string maestro, Fiddler Adam and the legendary M People, led by Heather Small. In what was a truly breathtaking auction, spearheaded by Charlie Ross, the star item was a stunning necklace kindly donated by local retailer and friends of The Lord's Taverners and Charles Hurst Group, Lunn's The Jewellers. The funds raised from the event will be divided between The Lord's Taverners and the Cancer Fund For Children. Robin Walsh, President of the Lord's Taverners NI region, said he couldn't speak highly enough of the work the charity undertakes. Gillian Creevy, Chief Executive of the Cancer Fund for Children, said the charity was delighted to be a partner at the event with the Taverners. "The Waterloo Ball is the party of the year and it is very exciting for us to be involved." TV presenter Chris Tarrant, a former UK President of the Lord's Taverners, spoke highly of the guests and contributors to The Waterloo Ball in Northern Ireland. "We will be raising so much money for thousands of children across the UK and Ireland who haven't had the best start in life. I can't thank everybody enough for all the support they have given," he said.